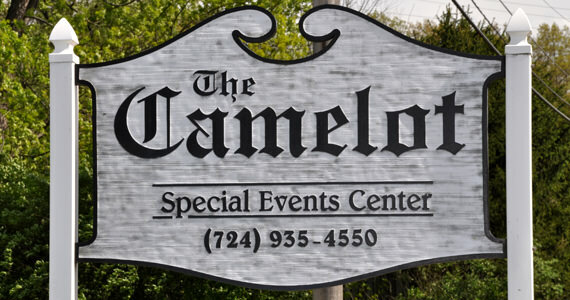 Our current vendor spotlight features The Camelot Banquet Hall, which is located just off of route 19 in Warrendale, PA. Originally constructed in 1913 as a Presbyterian church, the location has since been transformed into a magnificent banquet hall where thousands of newlyweds have started their new lives together as husband and wife. 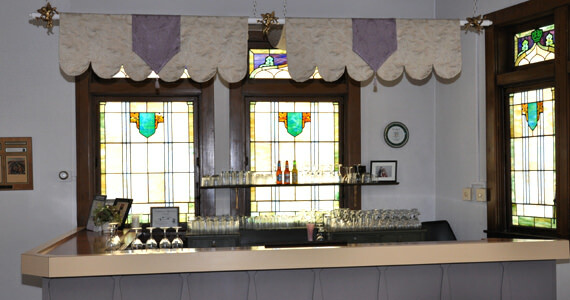 The outside of the banquet hall still resembles an old church and is tastefully landscaped and well maintained. When you enter the hall, you will be amazed at the completely renovated interior which boasts high vaulted ceilings and three walls of stained glass windows, which provide an intimate & romantic glow to the room. The Camelot is carpeted throughout, with the exception of a built in hardwood dance floor. There is even a stage, which is the perfect setup location for a band or disc jockey. Lighting is provided via several elegant brass chandeliers, which are fully adjustable. 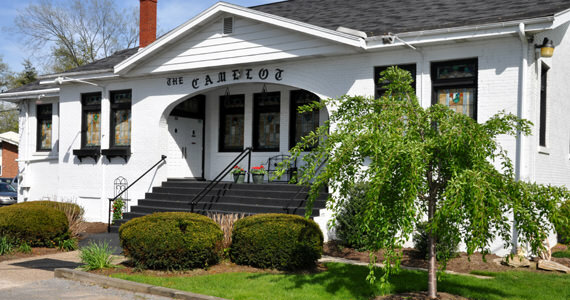 The Camelot is a “sole use” facility. 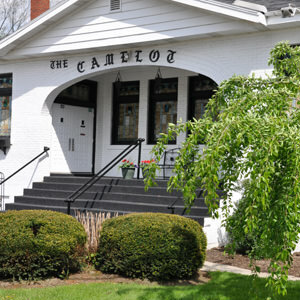 This means that when you book an event at The Camelot, your event will be the only event held at that time. 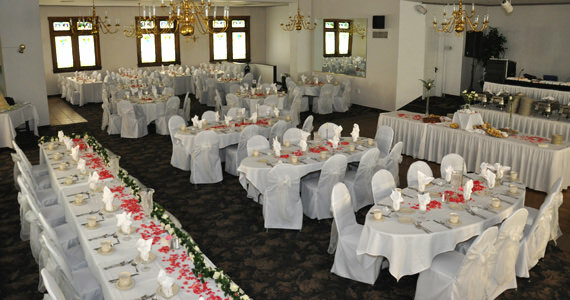 This allows the banquet staff to focus 100% of their attention on you and your guests. 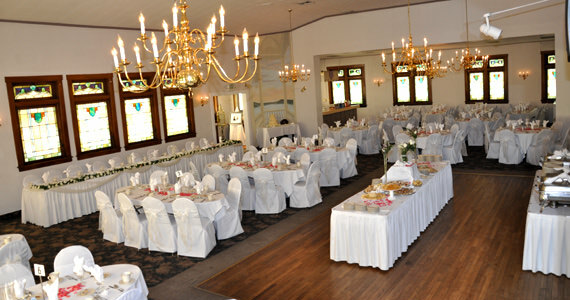 While most other banquet halls offer a 5 hour wedding reception, The Camelot’s standard wedding package allows for up to 6 hours use of the facility. Seating can be arranged using either round, oval, or rectangular tables and the room has a comfortable capacity of up to 180 guests. Their wedding package also includes many other amenities such as a fully equipped bar with quality glassware, centerpieces for all tables and candelabras for the bridal table. Over the past few years I have had the pleasure of working with Robert Malone several times and I can honestly say that his meals are nothing short of excellence. 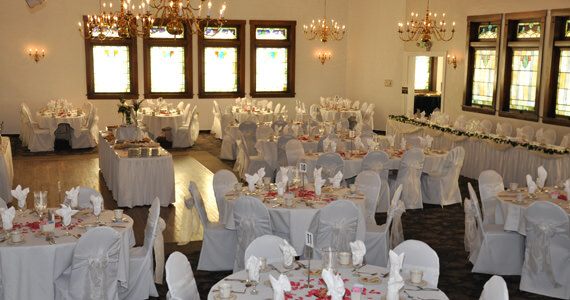 The only negative that some brides & grooms will notice is that the banquet hall is not handicap accessible. If you have guests that require wheel chair access then this can be an issue. Robert is currently working on a solution and hopes to obtain necessary approval to not only add wheel chair access, but also increase the size of the ballroom with a moderate addition to the facility. He hopes to have the expansion completed by the 2010 wedding season.